Combine onions, carrots, celery and 1/4 cup of chicken broth. Sauté vegetables in broth and reduce. Season with salt and cumin to taste. Add ground turkey and brown. Cut bell peppers in half from top to bottom and core and clean out seeds. Place in a small baking dish. Fill peppers with turkey mixture, cover with foil and place in a 400 °F (205 °C) oven for 30 minutes. Uncover and sprinkle peppers with grated string cheese. Place under broiler for 5 minutes until cheese is bubbly. 88 members have added this recipe to their cookbook. DELICIOUS!! I made it exactly as written and could have eaten them all. A forever keeper!! Having a preschooler means taco Tuesdays are in demand. 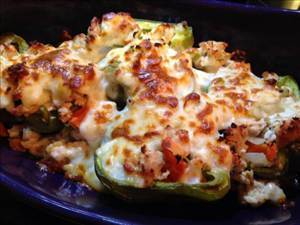 There are 221 calories in 1 serving of Stuffed Peppers. Calorie break-down: 18% fat, 19% carbs, 63% protein.